The Dynamics of Scientific Research has lately evolved with the increase in number and professional value of our own Staff. The rhythmical elaboration of field materials, the publication of articles in books and magazines, as well as with the publication of Acta Universitatis, the three professional fields and the annual organization of scientific sessions of communications with international participation have contributed to the academic prosperity of the institution. The organization of the fourteen students' debating societies, as well as the students' communication sessions programmed by the University are in line with the overall aims of the University. The numerous volumes of teaching aids in the libraries in Cluj-Napoca and Baia Mare, as well as book titles, lectures, courses and subscriptions to outer publications all constitute useful sources for field information and documentation. The Scientific Conferences of “Bogdan-Voda” University have been organized annually since 1996 and have approached a vast range of theoretical, methodological and practical topics, in the field of specializations that make up the teaching structure of the institution. The table below presents the conferences organized up to the present, at “Bogdan Voda” University, at the headquarters in Baia Mare and Cluj-Napoca respectively. 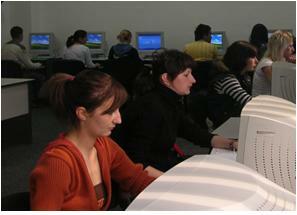 Scientific research at “Bogdan Voda” University also involves the organizing of student scientific groups. These groups aim at the establishment of links between the theoretical and practical aspects, the development of team work, the encouraging of students to publish their work. The topics approached within these groups should be adapted to the themes chosen for the diploma projects. Students have thus the opportunity to present chapters of their graduation projects within these groups.